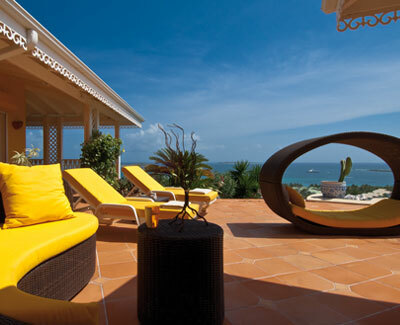 Coccinelle is a superb, newly renovated home with breathtaking views of the Atlantic Ocean, Anguilla and St Barth. All four air-conditioned bedrooms (all king-size) are fairly equally sized and have exterior access and each has an en-suite marble bathroom featuring showers and twin vanities--the master en-suite has the addition asset of a full size bath tub. Further details that add to the quality of Coccinelle include an oval pool, flat screen TV with US Cable channels and WIFI internet connection. Conveniently located in the gated residential area of Le Parc de la Baie Orientale, and only a short walk from restaurants, shops and the famous 'St Tropez of the Caribbean', Orient Bay Beach with its plentiful beach bars, restaurants and water sports. Coccinelle offers the ideal vacation venue for family groups or couples alike.